What you see above is a card i won recently on eBay. It is from "Authenticated Ink" and the original item had an 1867 penny in the hole. I also saw a Bob Feller card, and after some research have found Jack Nicklaus versions and Tiger Woods. I poked around a bit and it seems the dates associated with these cards are either 2003 or 2008, depending on which ones you look at. Does anyone know anything about checklists or who actually made them (that is, who *IS* "Authenticated Ink")? If so, please let me know. Thanks! I'll check my SCD Catalog when I get home. I don't find any info on them at my usual haunts on the web. 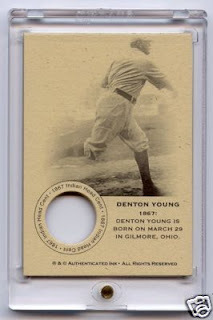 Now, it took me a few minutes to realize that Denton Young is actually Cy Young. Doh! It's amazing to me that there is NO info on either this company or this product (checklist, rarity). Was it a fly by night eBay store, or a legit brick and mortar business? Someone has been making and selling these "cards" on Ebay for a long time now. Some of the examples look OK, but they're not licensed so they will hold little value in the long run. You won't find any info on them in any SCD. Even though they are not licensed, they have been in circulation for 3 years. Once they are out of business if not before they will play a part in the hobby. They are actually pretty neat cards. Some of the coins are worth more than what you would pay for the card. What kind of finish is on these cards? Is it glossy or matte? Thanks! I would need to check, but I think they are matte. Matte for sure.I got a little collection of the Baseball penny card,boxing,hockey. I have 3 of the baseball cards from the set (all Koufax) and they are really neat cards! I guess that if you like glossy gold foil Upper Deck cards then you probably won't like these. They are matte finish and have a vintage feel to them. For under $10ea they are hard to beat! If you collect oddball cards like me then they are a must. I really do like them! I think they are really cool, I collect dan marino cards, I have an extensive collection, hard to find any new cards to add but authenticated ink has 10 different marino cards I've never seen, 1 test card, and a penny, nickel and dime card from 1982 (college), 1984 (rookie) and 1989 (professional)...they are not topps but none the less, they have a lot of collectible value to people like me...I paid about $6 each and also bought some other really cool indian head and buffalo nickel non-sports cards...bottom line, I'm really happy with them! I would say they are collectible and will hold value. A collection of 500, sold for over $2,000 at auction. Remember they are no longer in print and they are becoming harder and harder to find. If you are really; looking to make some reliable profits from the stock market, this software helps you a lot.